Changes in blood and tissue pH accompany physiological and pathophysiological conditions including exercise, cardiac ischemia, ischemic stroke, and cocaine ingestion. These conditions are known to trigger the symptoms of electrical diseases in patients carrying sodium channel mutations. Protons cause a diverse set of changes to sodium channel gating, which generally lead to decreases in the amplitude of the transient sodium current and increases in the fraction of non-inactivating channels that pass persistent currents. These effects are shared with disease-causing mutants in neuronal, skeletal muscle, and cardiac tissue and may be compounded in mutants that impart greater proton sensitivity to sodium channels, suggesting a role of protons in triggering acute symptoms of electrical disease. 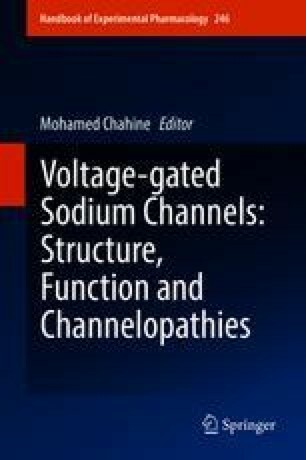 In this chapter, we review the mechanisms of proton block of the sodium channel pore and a suggested mode of action by which protons alter channel gating. We discuss the available data on isoform specificity of proton effects and tissue level effects. Finally, we review the role that protons play in disease and our own recent studies on proton-sensitizing mutants in cardiac and skeletal muscle sodium channels.